"I travel for travel’s sake. The great affair is to move; to feel the needs and hitches of our life more nearly; to come down off this feather-bed of civilisation, and find the globe granite underfoot and strewn with cutting flints. Alas, as we get up in life, and are more preoccupied with our affairs, even a holiday is a thing that must be worked for. To hold a pack upon a pack-saddle against a gale out of the freezing north is no high industry, but it is one that serves to occupy and compose the mind. And when the present is so exacting, who can annoy himself about the future?" from Travels With a Donkey in the Cévennes, "Cheylard and Luc"
"What that pace was, there is no word mean enough to describe; it was something as much slower than a walk as a walk is slower than a run; it kept me hanging on each foot for an incredible length of time; in five minutes it exhausted the spirit and set up a fever in all the muscles of the leg. And yet I had to keep close at hand and measure my advance exactly upon hers; for if I dropped a few yards into the rear, or went on a few yards ahead, Modestine came instantly to a halt and began to browse. 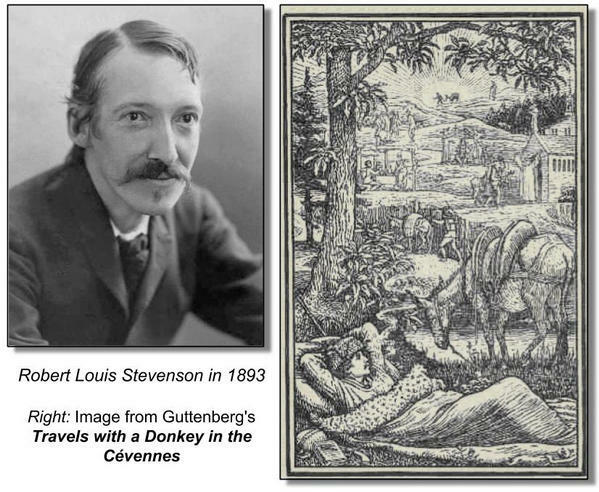 The thought that this was to last from here to Alais nearly broke my heart..." from Travels With a Donkey in the Cévennes,"The Green Donkey Driver"
"I have been after an adventure all my life, a pure dispassionate adventure, such as befell early and heroic voyagers; and thus to be found by morning in a random woodside nook in Gévaudan—not knowing north from south, as strange to my surroundings as the first man upon the earth, an inland castaway—was to find a fraction of my day-dreams realised... from Travels With a Donkey in the Cévennes,"A Camp in the Dark"
"But it is the Pacific that exercises the most direct and obvious power upon the climate. At sunset, for months together, vast, wet, melancholy fogs arise and come shoreward from the ocean. From the hill-top above Monterey the scene is often noble, although it is always sad. The upper air is still bright with sunlight; a glow still rests upon the Gabelano Peak; but the fogs are in possession of the lower levels; they crawl in scarves among the sandhills; they float, a little higher, in clouds of a gigantic size and often of a wild configuration; to the south, where they have struck the seaward shoulder of the mountains of Santa Lucia, they double back and spire up skyward like smoke. Where their shadow touches, colour dies out of the world. The air grows chill and deadly as they advance. The trade-wind freshens, the trees begin to sigh, and all the windmills in Monterey are whirling and creaking and filling their cisterns with the brackish water of the sands. It takes but a little while till the invasion is complete. The sea, in its lighter order, has submerged the earth. Monterey is curtained in for the night in thick, wet, salt, and frigid clouds, so to remain till day returns; and before the sun’s rays they slowly disperse and retreat in broken squadrons to the bosom of the sea. And yet often when the fog is thickest and most chill, a few steps out of the town and up the slope, the night will be dry and warm and full of inland perfume." from Across the Plains with Other Memories and Essays, "The Woods and the Pacific"
In Sum, It's Time Well Spent! So let's summarize. As these samples show, Stevenson's travel essays offer vivid imagery, insightful descriptions, and unique perspectives that infuse the little things in life with great meaning. They also take you back in time to far-flung places that were not yet wired in to the rest of the world... places whose relative strangeness gently nudges you toward an inevitable re-evaluation of your own time and place. In short, these essays provide a powerful "theater of the mind" that will inspire, enlighten and lift you up out of the doldrums of whatever gossipy news, political rants or other negative stuff is pummeling your consciousness. Time spent with these essays is definitely time well spent! The Links: Lots of Free Stuff! Everything listed below is free. And it's all available in a form that your device, no matter what it is, can readily use. Enjoy!